At a touching ceremony on Wednesday October 10th, Grapevine Center highlighted Mental Illness Awareness Week by commemorating the deaths of eight of their members. The keynote speaker was County Commissioner Kevin Boozel who has a background in Mental Health care. 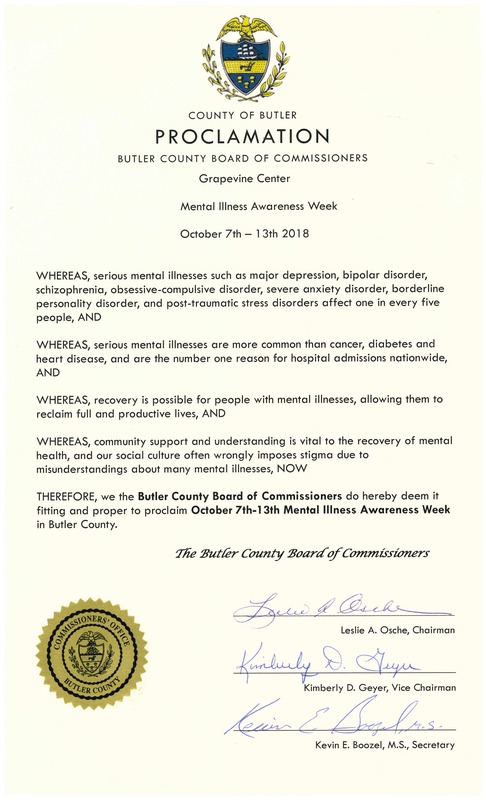 Boozel read the Butler County Proclamation which acknowledges the problem and recognizes Mental Illness Awareness Week, then presented it to Bette Peoples, the executive director of Grapevine Center. People with mental illnesses die on average 10-20 years earlier than those who do not. This is due to medications, often poor diet, lack of care, poverty, self-medication and drug addiction, among other reasons. 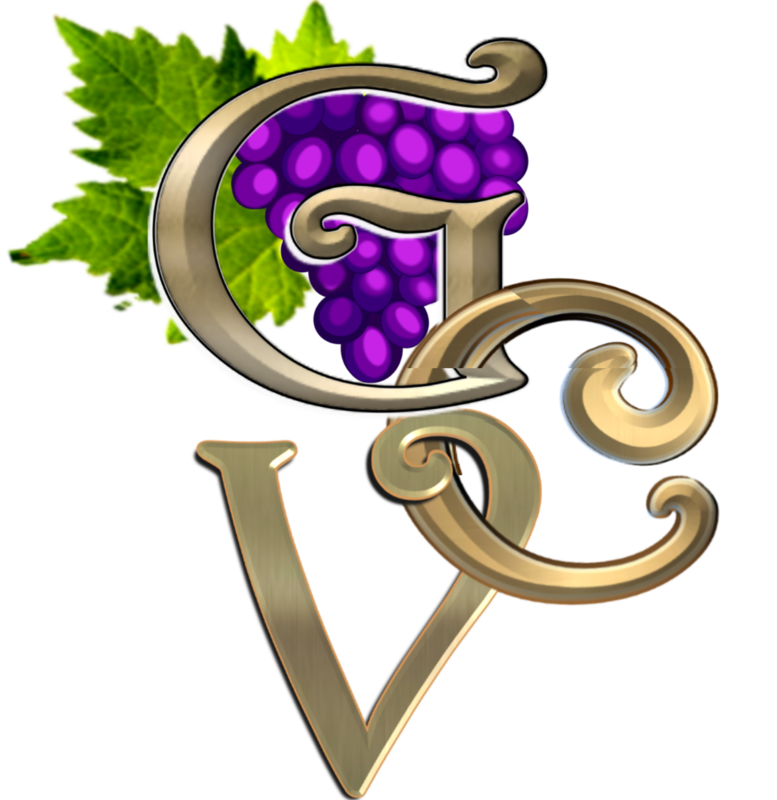 Indeed, among those Grapevine members who had passed on were two suicides; one person who had died as a result of falling off the bandwagon back into addiction; and one who possibly died from the effects of his medications. The ages were 36, 39, early 50’s, and two were in their early 60’s. All were taken away too soon. Boozel observed that there was a false judgement out there that people were impoverished because of bad decisions, or unhealthy or obese because of bad choices in nutrition. What if that poor nutrition is all you can afford? he asked rhetorically. He urged everyone to practice the best nutrition they could afford, and stressed his efforts to achieve fair housing for everyone. The audience learned that when the state mental institutions like Torrance State Hospital were closed around the country, there were some $3 billion which became redundant. Some of this was re-allocated to community supports, though far less than the $3 billion they had spent previously. The community, and organizations like Grapevine Center, had done a wonderful job of integrating people into the community, but many people were totally dependent on the funds that went into their food, housing, medical care and other support. This, however, is the first area where funds and supports are cut whenever there is an economic crunch. When it was the turn of family members and friends to pay tribute to the deceased, Allison McKinstry of Erie, a cousin of one deceased member, said she was only now discovering how many people and organizations, especially the Grapevine, had contributed to making Joey’s life bearable and even enjoyable. She “cringed” at the thought of what might have happened to him without their support and care. The ceremony ended with a candlelight procession a poem and a hymn. The poem emphasized that while those with a mental illness had been dealt a bad hand of cards, the cards themselves did not matter; it was the way they were played that mattered. Scientists have been able to measure the frequencies of emotions, the lowest being shame and guilt, climbing the scale to courage, gratitude, compassion and love. These emotions create a magnetic field (also measurable) of which we are all part, and which makes up the earth’s magnetic field. We are all connected. Therefore, as little and as powerless as each of us may feel ourselves to be, each one of us has the power to influence both Man and Earth for good through our choices and strivings regardless of our setbacks. The ripples of each life have far reaching effects — for good or not. Similarly, the sufferings, or the fates of each individual or group affects society as a whole. Furthermore, Darwin was wrong: Humans did not survive and thrive through competition, but rather through cooperation. How can we all cooperate today, to improve Mental Health in ourselves and society? County Commissioner Kevin Boozel reads the Butler County Proclamation and presents it to Bette Peoples, Executive Director of Grapevine Center. The lives of eight Grapevine members who had passed on were celebrated and commemorated at the event. Please note that Grapevine Center has met with Butler County Police in the past, to foster better understanding of people with mental illnesses and how to deal with them in a way that does not lead to escalation. Once again, in September, Butler County Police came to the Center to meet with our members and talk about any issues. We hope this friendly interaction and the willingness of the police to understand the issues faced by people with mental health issues and learn to work with them, will continue and bear fruit.